In this darkly ironic, multiple-mystery/drama, even the past cannot suffocate the insatiable human heart. Driven by overwhelming longings, both the outliers and the establishment in this labyrinthine-plotted tale refuse to accept the roles society has forced upon them. In 1859, Durksen Hurst, a visionary charlatan on the run, encounters a dozen hungry slaves stranded in the Mississippi wilds. Led by the deceptively simple-looking Big Josh, together, they agree to build their own egalitarian plantation, with Hurst acting as figurehead "master" to hoodwink the town. But wise Big Josh fears that Hurst's grandiose schemes may doom them all to the hangman's noose. In the town, the reclusive widow, Marie Brussard French, manipulates the region's bankers and cotton brokers, everyone...except her frail, rebellious heir-apparent, Devereau. Driven by unbearable loneliness to mad acts, Devereau threatens to expose the family's own tenuous fa ade-which would prove fatal to the Frenches. Meanwhile, Antoinette DuVallier, a beautiful, Cassandra-like fugitive from New Orleans with mysterious ties to the Frenches, arrives on her own desperate mission. Her overpowering presence detonates long-repressed conflicts, unleashing a devastating upheaval of fire and blood that tears asunder the once-sleepy hamlet. As the story's tangled webs of deceit unravel, each startling plot twist and cathartic revelation shines a fresh light on what it means to be a man, a woman, free or enslaved-indeed, what it means to be human. 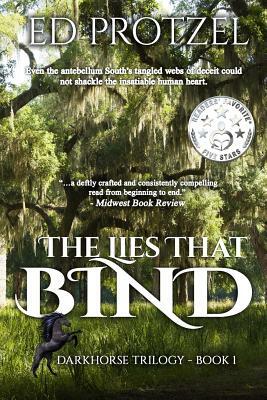 The Lies That Bind is the first novel in Ed Protzel's "Dark Horse" trilogy. Ed has written five screenplays for feature film and developed projects for Hollywood. He has a Master's in English from the University of Missouri-St. Louis. Ed lives in St. Louis, Missouri, where he teaches college English.